The notorious delinquent and the number one bro. 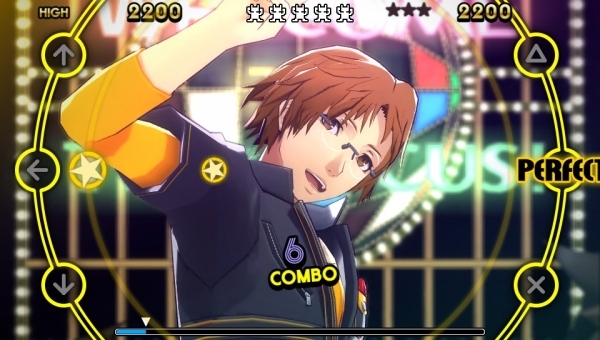 Atlus has released a set of English character trailers and screenshots for Persona 4: Dancing All Night characters Kanji Tatsumi and Yosuke Hanamura. The PS Vita rhythm game is due out in North America on September 29. Watch the trailers below. View the screenshots at the gallery. YA WANT SOME?! WELL OK THEN! Up next on the Midnight Stage is Kanji Tatsumi! The notorious delinquent has a tough exterior, but deep down, Kanji has a soft spot for anything cute, which is why he won’t let anyone stop him from rescuing the members of Kanamin Kitchen! Persona 4 fans get a chance to see Kanji prove he’s all man with his powerful dance moves as he and his Persona defeat Shadows and bring down the house!